ATLANTA — Democrats are considering a plan that would limit — but not abandon — the influence of “superdelegates” in the next presidential primary, after a bruising 2016 primary prompted allegations by Bernie Sanders’ supporters that the system was rigged. The changes, outlined in a draft proposal obtained by The Associated Press, probably wouldn’t have made a difference in last year’s primary. Hillary Clinton received at least 3 million more primary votes than Sanders. But the new proposal would dent the ability of heavy favorites like Clinton to stockpile early endorsements and claim a wide delegate lead before voters actually cast ballots. The proposal would dent the ability of heavy favorites like Hillary Clinton to claim a wide delegate lead before voters actually cast ballots. Superdelegates are the party leaders and elected officials who get a say in the nomination race. In 2016, they favored Clinton by lopsided margins, and Sanders supporters believe he lost the nomination in part because of it. In the draft proposal, a special national party commission calls for keeping some 400 members of the Democratic National Committee as automatic delegates to the convention. But under the new rules, those superdelegates would have to tie their votes on the convention’s first ballot to the outcome of primaries and caucuses. In 2016, all superdelegates were allowed to support either candidate. Some superdelegates would retain their right to vote as they please. That includes member of Congress, sitting governors and other high-profile party elders, a group that varies in size from convention to convention. At the 2016 convention, unpledged superdelegates accounted for about 15 percent of the all votes. As it stands, the proposal would at least cut that share in half. The proposal tracks a compromise already endorsed by the Sanders and Clinton camps. The issue is among several that will be debated Friday and Saturday at the final meeting of national Democrats’ Unity Commission, a panel appointed by Clinton, Sanders and DNC Chairman Tom Perez to recommend changes for the party after the last contentious primary season. The full national party committee will consider the commission’s ideas next year. Cohen and other Democrats stressed, however, that commission members have been busy circulating amendments ahead of the commission’s weekend gathering in metro Washington. 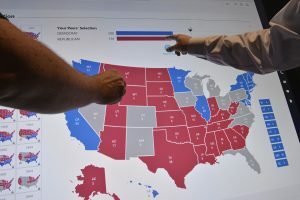 Left: Delegates point to an electoral map at the Democratic National Convention in Philadelphia. Photo by REUTERS/Charles Mostoller.